Who doesn’t want MOORE Balance? Do you ever feel like you are at constant risk for falling? Is your cane or walker just not cutting it to prevent you from falling? Canes and walkers are not the only solution to help keep you stabilized. We have MOORE options for you. 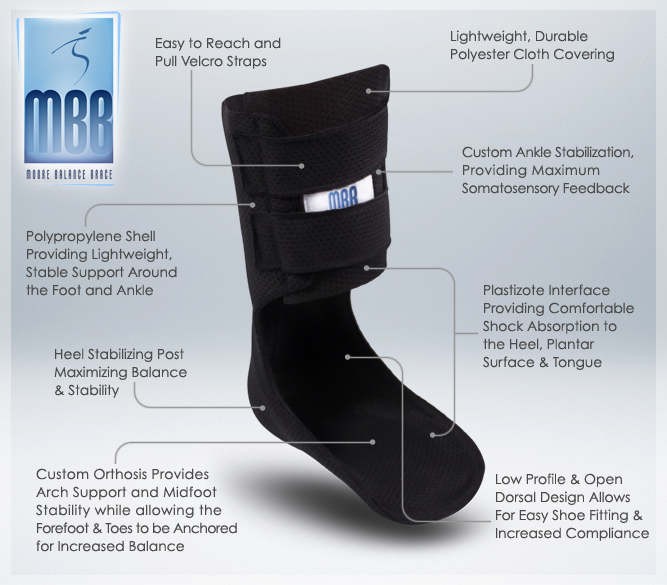 With the Moore Balance Brace it is not just an over the counter product, it is customized for your foot. Not only does the brace have great support for your ankle and foot, but it fits into most supportive shoes without having to buy a new pair with a larger shoe size. Our doctors can also give you recommendations that will easily accommodate the brace. The brace was designed by a physician for people who need and deserve a change in their life. We want to improve the quality of your life so you don’t have a fear of falling whether you’re walking in your home, taking a walk outside, or participating in your day to day activities. There is no need to worry about complex latches or a heavy weight brace to take on and off. Moore Balance Brace is light weight and has Velcro latches which make it simple to use every day. This long term solution will help you feel confident about walking without feeling the need to touch or hold on to a wall, shuffle when you walk, or stumble.